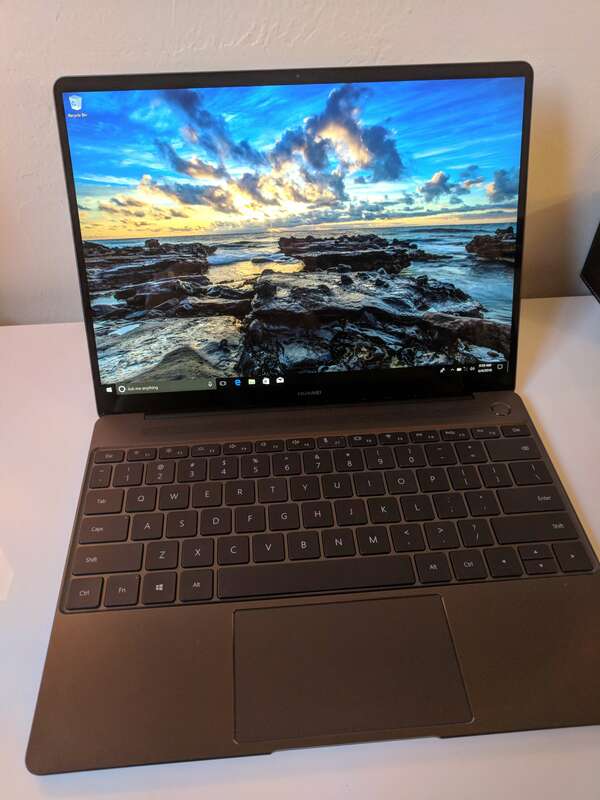 Having used the Huawei Matebook X for several weeks, I found it to be an exceptionally good Windows 10 ultra thin notebook PC. The performance is outstanding with solid battery life and a keyboard that is wonderful compared to others in this style of laptop. I was equally blown away by the stunning display that was bright, crisp, and easy on the eyes. From a design perspective, the Matebook X fits in the now classic style of an all aluminum body. It measures 12.5 mm x 286 mm x 211 mm and weighs just 1.05kg. That’s .49 x 11.2 x 8.3 inches in old money and a weight of 2.3 lb. Opening up the laptop exposes the beautiful 13″ IPS display that renders at 2160 x 1440, providing 200 PPI. It has a 178° viewing angle, has a 1000:1 contrast ratio and has a brightness of 350 nits. I’ll go into details about the display later in the review but it is impressive. The Huawei Matebook X is powered by either the 7th generation i5-7200U or i7-7200U processor depending on the configuration you purchase. The i5 model, is coupled with 4GB of LPDDR3 RAM and 256GB of SSD storage. If you pick up the i7 model, which is what Huawei sent me to review, you get 8GB of RAM and 512GB of storage. In either configuration, you have the Intel HD Graphics 620 GPU for graphics. Port wise, you have two USB-C port, one on the left side of the chassis and one on the right near the display hinge. On the left side you will also find the 3.5mm headphone jack. You also have dual digital microphones and dual speakers built into the chassis, which is configured for Dolby Atmos Audio. Just above the keyboard is where you will find the two-in-one power button and fingerprint scanner. The Matebook X fully supports Windows Hello for biometric authentication. From a communications perspective, you have a 2×2 MIMO configuration for WiFi that supports 802.11a/b/g/n/ac at either 2.4GHz or 5GHz. Bluetooth is version 4.1. The built-in keyboard of the Matebook X is a full size, chicklet style board. It has a 1.2mm stroke for the keys, has automatic backlighting, and is splash resistant. You can’t submerge the keyboard but if you splash a bit of water or some coffee on it, you don’t have to worry about it seeping down into the electronics of the laptop itself. From a design perspective, the Huawei Matebook X is stunningly beautiful. The all aluminum chassis is compact and easy to carry as well as slip into a briefcase or satchel. There is no denying that the Matebook X draws some of its design from the latest MacBook Pro – and that’s not a bad thing. Another nice feature of the design of the Matebook X are the dual USB-C connections. This makes adding a hub or other accessory to the device easier than a single port design when charging the laptop. Keep in mind that Huawei designed it so that it will only charge on the left side port. If you try to charge the device from the right side, you get a warning telling you to charge from the left. The right port is aimed to do data transfer and connect you to the Matedock 2 accessory. Personally this is the only thing I’d like to see changed on the laptop. There are times where connecting to power from the right side is handy, depending on your desk configuration. That isn’t a big deal at home, but on the road in a hotel, it can be a bit of a challenge sometimes. Simply put, there is nothing disappointing about the display on the Huawei Matebook X. The 13″ IPS display is stunning, with deep rich colors. Having reviewed other Huawei devices in the past, my expectations for the Matebook X were high. I was not disappointed. You can easily spend several hours working on the laptop without getting eye fatigue (although it is healthy to stand up and take breaks of course). As with other premium laptops, the Matebook’s display is a bit tough to see in bright sun due to reflections but the brightness of the screen can overcome that to a degree. Color wise, the accuracy is excellent and given the contrast of the screen, color depth and contrast is very appealing. Huawei rates the 41.4 Wh battery as providing 10 hours of life between charges under normal usage (i.e. screen not set to full brightness, audio not at full volume, etc.). I have always found that Huawei s quite accurate on their estimates and the Matebook X is no exception. In my testing for this review, I averaged about 9:38 minutes between charges. For me, this is well within acceptable tolerances and is enough to get me through a full business day without having to find power source to recharge. 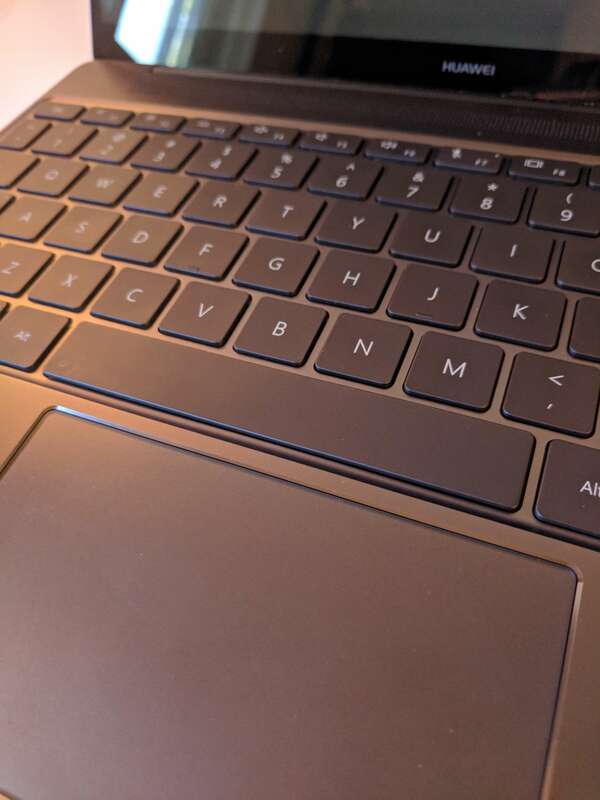 Ultra laptops like the Huawei Matebook X have notoriously had poor designed keyboards. It is the area where manufactures have cut corners to either keep costs down or to get a keyboard scrunched into a shallow depth form factor. The poster child for these poor keyboards right now is the new Macbook where there is now a class action lawsuit against Apple over it. In my view, Huawei won’t face such challenges. The full size keyboard is beautiful and provides both excellent responsiveness to typing as well as solid tactile feedback. I frankly love this keyboard and the only keyboard I’ve found that rivals it is the one built into the Google Pixelbook. Huawei has done an excellent job on this keyboard, giving you plenty of room for typing comfortably for extended periods of time. They have also placed the wrist rests perfectly on the chassis so you don’t accidentally tap the trackpad. 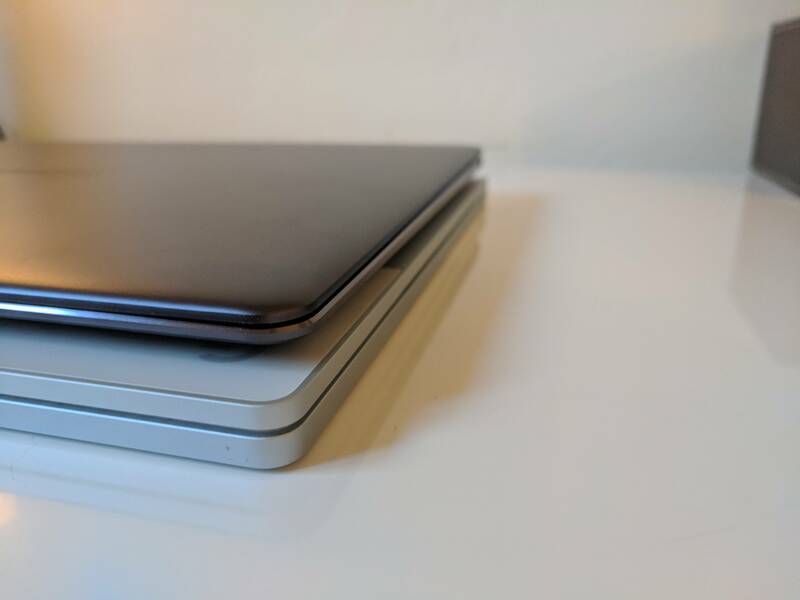 Speaking of the trackpad, I think readers will also be pleased with its performance. It is very responsive but not overly so. I found that “phantom” touches of the trackpad were mostly ignored. This usually happens from a rouge wrist touch in my case. The trackpad, as part of Windows 10, has a lot of customizations to help you personalize it for your use and needs. Perhaps the biggest disappointment with the Huawei Matebook X is that it does not come with Windows 10 Professional. Given the target audience for the device and price point of nearly $1000, Professional should be the flavor of choice on this device. There are some things that Windows 10 Pro gives like Bitlocker that, in a corporate or remote working environment are a must. Fortunately an upgrade to Windows 10 Pro is easily done right within Windows itself, but it is another $99. Currently the Matebook X is $998 on the Huawei Amazon store front for the configuration used in this review.